What’s New in Version 4.0 and 4.1? The first thing you will notice when running version 4 for the first time will be the new look of QDA Miner. We implemented a more modern-looking interface, with more icons than ever before. If you are already familiar with the menu structure of QDA Miner, you will find that almost everything remains in its original location. But we did split the ANALYZE menu in two in order to group all text- and coding-retrieval functions under a new RETRIEVAL menu, and we kept all the remaining analysis features under the existing ANALYZE menu.,Aside from these cosmetic changes, you will find a lot of powerful and unique new features. We really take the concept of “computer-assistance” seriously! QDA Miner has always offered more computer assistance for coding, analysis and report writing than any other qualitative software on the market. For example, QDA Miner 3.2 had not just one, but four different text-search tools: Boolean search, query-by-example, keyword retrieval and section retrieval. The version 4.0 continues this trend by implementing two truly innovative text-search tools: the cluster extraction and coding tool and the code-similarity search tool. These two new text-search tools based on machine learning and information-retrieval techniques represent very efficient tools for faster and more consistent coding. Make sure you check out the flash demos of these new features. The missing dimension in geotagging! We have witnessed the implementation of geo-tagging in other QDA software. We were not totally convinced of the value of such features until we realized that there was one crucial dimension missing: time. Many researchers need to locate events not only in space but also in time. They also need to examine the distribution of events on those two dimensions. QDA Miner 4.0 allows one to attach geographic coordinates and time tags to any coded segment or to an uncoded text segment, and to produce static and dynamic maps in Google Earth, ArcView or similar programs, as well as interactive timelines. We also added two related search tools. One of them, allows one to extract sentences and paragraphs with time or space information and to perform autocoding and auto-tagging. We also implemented a link retrieval tool that allows one to extract coded segments specific to a time period or within a specified distance from a geographic location. All these, in addition to the ability to attach custom placemarks, import locations from ESRI shapefiles and perform location searches, make of QDA Miner, one, if not the most powerful geotagging qualitative tools on the market. Improved visualization, more flexibility, and much more! 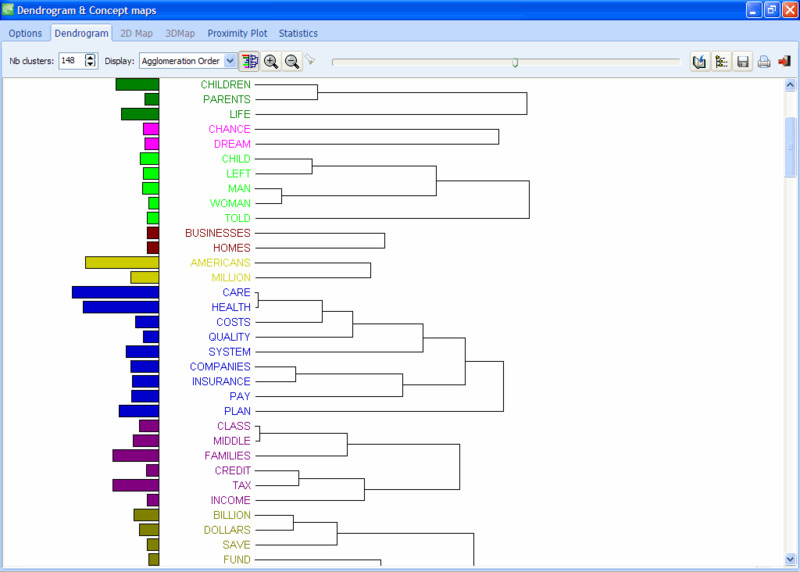 We made numerous improvements to existing tools, such as the memo-ing system, the dendrograms, the multidimensional scaling plots and the proximity plots. We also added tag clouds. The importation of PDF files has been greatly improved. Numerous new useful features have been implemented and will be greatly appreciated by current and new users. We even added an automatic backup feature. No matter how often we stress to our users the importance of keeping backup copies of their project and how easy backups can be performed in QDA Miner, many people still fail to back up critical data. So we implemented an automatic backup function that will be set by default to be triggered every month (one can disable this feature or customize it to be performed at shorter or longer intervals). Those are just a few examples of some of the new features of QDA Miner 4. You will find below more details of the most important changes in QDA Miner 4.0. Importation of data from MS Excel and text files is now up to five times faster. The compatibility with comma separated value files and UNICODE text files has also been improved. 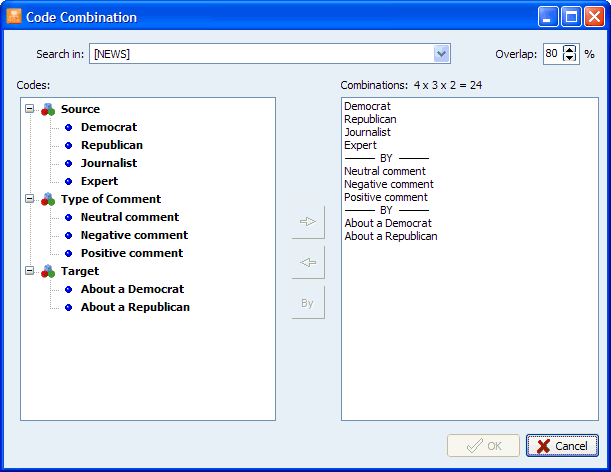 A powerful cluster extraction and coding tool allows one to group similar sentences or paragraphs into clusters and to code those using a flexible drag-and-drop editor. This feature is very useful to quickly code large amounts of short text items such as open-ended responses, Twitter feeds and customer feedback. This feature relies on a unique patent-pending algorithm that can increase the manual coding threefold and up to more than 100 times faster than it would take one to code similar unclustered text data. A new code-similarity retrieval tool allows one to quickly identify text segments similar to items that have been previously coded either in the current project or in another project. This feature could be used to speed up the coding of new text data or to identify items that you may have missed, increasing the reliability of your coding. Hyperlinks can now be attached to any text selection or coded segment, allowing one to move to a web page, a file, another case in your project, or other coded or uncoded text segments. One may also link a text selection or coded segment, or geographic and time coordinates (see next feature). QDA Miner now allows one to associate geographic and time coordinates to a text selection or to any coded text segment or graphic area, allowing one to locate events both in space and time. Geographic coordinates can be imported from KML or KMZ files, or cut from Google Earth and pasted into QDA Miner. One may then easily jump from a geo-link to Google Earth. 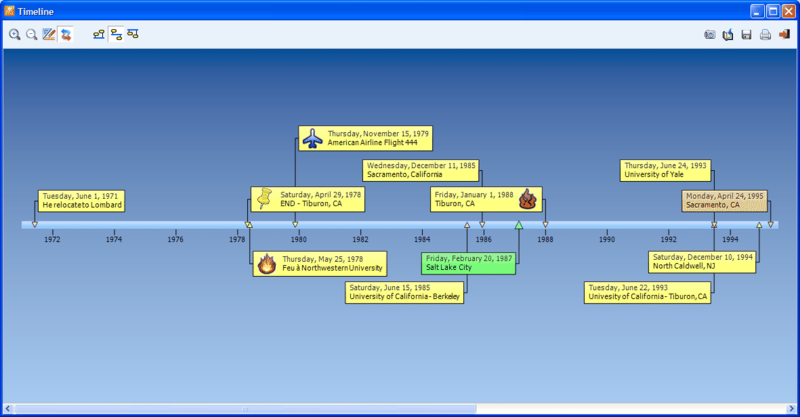 A flexible link-retrieval tool may also be used to filter and select relevant geo-linked or time-tagged events and display them either on a geographic map (with an optional time slider) or a timeline. A new text-search tool allows one to extract paragraphs or sentences containing references to specific dates or specific locations and to automatically attach a code to those retrieved text segments with a corresponding geo- or time-tag. A new CODE | COMBINE command allows one to quickly create compound codes based on the co-occurrence of existing codes. This is especially useful when text segments are codes multiple times along several dimensions (for example, speaker x tone x subject) and one needs to compute statistics or retrieve segments associated with combinations of all those dimensions. Coded graphic segments can now be highlighted, faded or masked, allowing one to visually stress specific regions of an image, dim or hide the surrounding context, and anonymize photos. This new function can be accessed through the HIGHLIGHT command in the IMAGE menu. Several highlighting options are offered including grey-scale transformation and luminosity adjustments for either coded regions or surrounding areas. The proximity plot feature now produces high-definition graphics and can now be used to display the proximity from more than one code using dual and stacked bar charts. One can now display the code frequency in MDS 2D and 3D plots using bubble plots. One can now display the coding frequencies along with dendrograms using a bar chart. The CODING FREQUENCY command can now be used to create tag clouds. A new PDF importation engine now allows one to keep the format of your original PDF, including tables and images (optional). It removes hyphens and line breaks to restore the original document structure (sentences and paragraphs) even for multi-column documents. A new spreadsheet editor allows fast editing of numerical, categorical, logical and date variables in a spreadsheet editor. Clipboard operations are supported for fast assignments of values to numerous cases. When a date variable is selected in the Crosstab page, a dialog box appears, allowing one to group all dates by decades, years, months, quarters, weeks, or days of the week. We implemented a much faster correspondence analysis algorithm. See timing results below. It is now possible in the 2D correspondence analysis to right-click an item and either remove it or produce a coding retrieval of the selected item. A new project option allows one to configure QDA Miner to automatically prompt the user to back up a project at a specific time interval and to specify a default backup location. Now, 3D rotations of graphics may be recorded and saved in an AVI movie format. A new option available in several coding analysis dialog boxes allows one to select codes based on their frequency or case occurrence. Up to six types of comments may now be created. One may differentiate comment types by various colors and customizable labels. The List Comment feature also allows one to filter the list of comments to show a specific type of comment. The text report for coded segments can now be customized, allowing the user to choose which information this report will include. QDA Miner can now import reference Information System (RIS) data files created by citation programs such as EndNote, Reference Manager, ProCite and Zotero, as well as many digital libraries like IEEE Xplore, ScienceDirect and SpringerLink. A dialog box allows one to select which fields to import. Such a feature will be useful for literature reviews or for the empirical study of scientific domains. Spelling mistakes are very common in text data obtained from social media, web surveys or customer feedback systems. Even if QDA Miner has several spelling-resistant search features, spelling mistakes may still reduce the ability to accurately retrieve and code relevant documents. A new FIND UNKNOWN WORDS command allows one to search through all documents in a project for unknown words and replace them in batch mode. QDA Miner will even remember replacements you did in other projects and offer you the possibility to reapply those replacements. The section-retrieval tool now allows one to define multiple criteria for the end delimiter. This allows the autocoding of focus-group transcripts, group-interview data or structured data when some fields may be missing. For example, if you want to code a group interview with three participants (for example, JL, PM and GR) and an interviewer (Q), you could specify a search that will retrieve everything starting after Q= (used as a prefix for the interviewer question) up to either JL=, PM= or GR=. One may now use the clipboard to paste a graphic or a photo into an image variable. One may now transform a document variable into a short-string variable, or may extract from string variables dates in various formats and store them in a new date variable. What’s New in Version 3 ?